It is fascinating to observe a master fine artist as he moves from a conceptual idea to the final painting. Finding the (8″ x 10″) sketch brought back memories of the days he spent painstaking preparing the paper. First it was a trip to the art store to purchase a large roll of paper with a nice texture and feel to it. Then, where and how was he going to paint this large painting? We lived in a small one bedroom apartment in Venice, CA. He didn’t own an easel at the time and as he looked around the apartment, he decided the kitchen wall was the best place to hang the paper. That way he could paint daily and step back to review it as it dried overnight. Soon he taped the top of the roll of paper to the top of the wall near the ceiling and draped it to the floor where he cut it from the roll and taped the bottom to the wall. Thus, the Kitchen wall became his easel, sandwiched between the refrigerator on the right and the kitchen cabinets on the left. A few more days went by and I noticed he hadn’t signed the painting yet. Well to me it was already a beautiful painting (truly a Masterpiece) and not being an artist myself, I couldn’t imagine what more he needed or wanted to do. A few more days went by and then one more brush stroke of pink (thus, the Pink Slipper) and he proclaimed, “Now it’s finished!” I stood in awe as he signed his signature in red; his traditional signature on the lower right side of the painting. 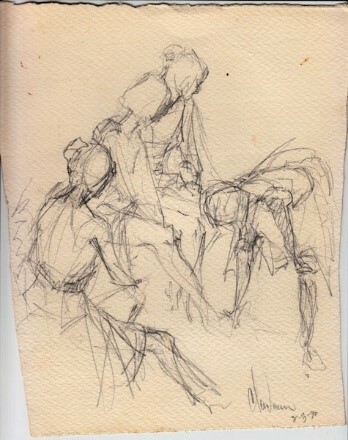 It’s interesting to note, on the back of the pencil sketch which he signed on August 3, 1990 he wrote the name of his client along with the notation; sketch for large watercolor called “Rehearsal.” As I search my memory for who the client would have been, I believe it was a friend or business acquaintance who Bernard had created some advertising and marketing brochures for his financial investment company located in Santa Monica, CA. This particular individual owned a single engine plane and Bernard loved the idea of flying; they were scheduled to go flying at a future date. As fate would have it Bernard’s friend was involved in a tragic small plane crash and the Pink Slipper has remained a treasure in our Private Collection of Bernard S. Clendenin Fine Art paintings and drawings.